Avoid paying inflated water bills. A 1" water loss in the average pool equals roughly 240-280 Gallons. A 240-280 gallon/day leak (or any significant fraction thereof) adds up to several thousand gallons on your monthly water bill. Leaks can cost from $20-$200 (or more) per month (larger leaks, i.e. in commercial pools, can cost thousands per month) just in water bills. Eliminate the waste & give us a call. Reduce your chemical costs. Of course, it's just not water leaving your pool--it's pool chemicals as well. Leaky pools tend more quickly to get out of chemical balance and create more maintenance problems (more work) for the homeowner. Cloudy water, algae growth, and degradation of the pool interior are all exacerbated by chemical imbalances brought on by a pool leak. You can easily calculate another $15-$25/month in lost chemicals for a moderate leak--much more for larger leaks. Avoid (further) structural damage. Fill water normally supplies only about half of the required minerals/chemicals your pool requires--pool water is normally very "hard". (Rain water & ,similarly, "softened" water deplete pool chemistry the most.) The result is a pool with a diluted water chemistry that will actively seek additional minerals/chemicals from the finish. A leaky pool's finish (over time) tends to degrade much quicker than a non-leaking pool. This applies mostly to concrete (gunite) pools, but also (to a lesser degree) to fiberglass & vinyl lined pools. Besides pitting in cementious finishes, metallic solder joints (i.e. in pool light niches) & tile/grout joints are also very susceptible to diluted water chemistry. Despite popular belief, leaks rarely "wash" dirt away from the pool. Florida soils are extremely porous & tend to absorb (up to) very high volumes of water flow. Moist soil does, however, compact 10%-15% more than dry soil. Compacting soils "shrink" away and reduce their support underneath adjoining decks causing settling & cracking. Because the pool deck lies on top of the pool shell (in gunite pools), shifting decks tend to crack the upper shell of the pool (also known as the beam of the pool). The longer the pool leaks in a certain area, the more the adjoining deck will settle, the more beam cracking will occur, the more leakage occurs. It's a vicious cycle that only promises to cause more damage over time. Settling decks & soil are also the primary cause of underground plumbing breaks. Again, the longer leaking pool water compacts the outside adjoining soil the probability of both structural & plumbing leaks increases. Prevent equipment failure. Frequently, ongoing leak issues will cause water levels to recede below the skimmer mouth. Homeowners, despite their best efforts, aren't always around to throw in the fill hose when necessary. This can lead to extended dry-pump conditions which will ruin the pump. It usually takes at least an hour or more (usually many hours) of the pump running completely dry before enough heat is built up to break the seal & allow pool water to compromise the front bearing. Melted strainer baskets and discolored/distended pump fittings are also signs of dry-pump conditions. It pays for itself. Calculating the above 4 cost factors, the repair of your "average" leak will usually pay for itself in less than 6 months (less than 2-3 months for larger leaks). 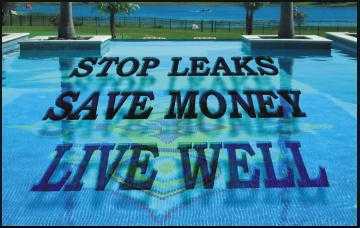 It just makes sense to stop your leak, save money, and have peace of mind.